LAS VEGAS, Nev. - No. 13 Boston College and Northern Michigan traded blows in the consolation meeting of the IceVegas Invitational, but 65 minutes of hockey could not yield a victor as the Eagles and Wildcats skated to a 3-3 draw on Saturday night at T-Mobile Arena. Following the five-minute overtime session, there was a five-minute three-on-three event, but the game would have still gone down as a draw if someone scored in that window. There was a three-man shootout following the 3-on-3 session and the Wildcats converted their first two chances to win that portion in the end. Junior captain Christopher Brown scored BC's third short-handed goal of the season while sophomore forward Julius Mattila stretched his point streak to nine games with his six goal of the season as well as an assist. Sophomore goaltender Ryan Edquist stopped 26 shots, including three in the double overtime session as his record moves to 3-2-1 on the season. T-Mobile Arena / Las Vegas, Nev.
- Captain Christopher Brown scored Boston College's third short-handed goal of the season in the second period against Northern Michigan. It marked his first short-handed goal of the season and second of his career. The Bloomfield Hills, Mich. native is now tied for the team lead in goals scored with six. - Sophomore Julius Mattila is one of three Eagles tied for the team lead with six goals this season after the Tampere, Finland native stretched his point streak to nine games on Saturday evening. The sophomore forward leads the Eagles with 18 points (6-12-18) through the NMU outing. During his hot streak, Mattila has accrued 14 points (5-9-14) amidst his nine-game tear and notched at least one point in 10 of his last 12 games. 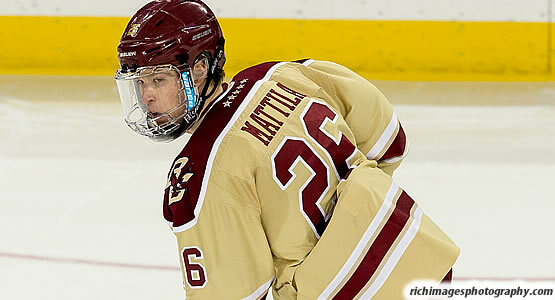 Mattila also assisted on Cotton's goal midway through the third for his third multi-point of the season. - Sophomore forward David Cotton has meshed together a five-game pointstreak of his own and stayed hot the latter part of the first half of the season. The Parker, Texas native tallied his fifth goal of the season midway through the third period to account for at least one point in eight of his last nine outings, including four multi-point performances in that run. The second-year winger is now second on the team in scoring with 16 points (5-11-16) through 21 outings. - Graham McPhee accounted for a pair of assists against Northern Michigan on Saturday night, marking his third multi-point performance of the season. The Las Vegas native notched a career-best three assists against Holy Cross last season on Oct. 22, 2016. - Northern Michigan capitalized off of a turnover in the early goings of the first period and turned it into a 1-0 lead. Philip Beaulieu grabbed the puck off a fallen Eagle in the far zone and wheeled it around the net. Rylan Yaremko streaked in from the top, found the seam and accepted the wide-open pass in between the circle. With no one in front, Yaremko beat BC goaltender Ryan Edquist with a low snap shot to give the Wildcats a 1-0 advantage at 6:43 of the first frame. - Connor Moore took a penalty at 3:47 but that did not matter to the BC penalty kill as Christopher Brown tied it up nine seconds later at 3:56. Graham McPhee won the draw in Boston College's end and flipped up to Brown for the breakaway. Brown deked once to the right side and sniped it over NMU goaltender Atte Tolvanen to knot the game up, 1-1, with the short-handed marker. - One second after the Moore infraction expired, the Wildcats reclaimed their one-goal lead with a one-timer from Troy Loggins at 5:48 of the second period. Adam Rockwood got the puck to Beaulieu atop the left circle and Troy Loggins was wide open on the opposite side. Beaulieu dished through the zone to Loggins for the one-timer and he bashed it past Edquist to make it a 2-1 contest. - With 32 seconds left on the clock, the Eagles tied it up with a swift transitional goal quarterbacked by Jesper Mattila in Boston College's zone. Jesper Mattila zipped it out of BC's end to McPhee in the flank. McPhee quickly relayed it to Julius Mattila in motion on the blue and he skated in hard on Tolvanen. Julius Mattila made one quick move and maneuvered it past the Wildcats' netminder to make it 2-2 late in the second period. - Boston College took its first lead of the night on a heads up play by Julius Mattila and David Cotton midway through the third period. JD Dudek chipped the puck out of the neutral zone and Julius Mattila tracked it down behind the net, wresting off a Wildcat down low. Mattila won the battle and connected with Cotton out in front for the east tap-in past Tolvanen to make it a 3-2 Eagle lead at 9:17 of the third period. - A few minutes after Cotton's tally, McPhee was cited for interference at 11:14 of the third period and the Wildcats converted on the power play midway through the window. Northern Michigan controlled the play throughout the window and Loggins set up Beaulieu with a hard one-timer within the blue line that beat Edquist through traffic at 12:07 to tie it back up, 3-3, which proved to be the equalizer. Boston College will return to Hockey East action with a three-game homestand on tap. On Friday, Jan. 12, the Eagles will close out the regular season series against Providence at 7 p.m. followed by a Sunday matinee against New Hampshire. Sunday's contest against the Wildcats is scheduled for 1 p.m. BC will have that upcoming weekend off before hosting UMass on Tuesday, Jan. 23 at 7 p.m.